So, the quilt is done and you would like to have it hang - either on your wall or perhaps in a show. Since I rejoined the world of quilting five or six years ago, I have discovered that hanging a quilt is an art in itself, particularly in the realm of art quilts. For this post though, let's keep it simple. If you are thinking of entering your latest work in a quilt show, there is a good likelihood that one of the requirements will be a placing a sleeve on its back. 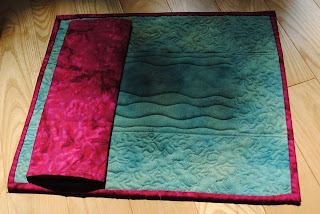 One of the best and simplest descriptions that I have found for how to construct and add a sleeve to the back of a quilt is in Gloria Hansen's blog. Rather than recreating the wheel here, please check out her post. I have used the technique she demonstrates (the photos are invaluable!) many times for quilts both big and small and am totally pleased with the results. What I particularly like about this sleeve is that an allowance is made for the thickness of the hanging rod. This means the top of the quilt is more likely to hang flat, rather than be slightly bowed by the hanging rod. You can see that extra allowance in the sideways photo of a completed sleeve below. The sleeve is also nicely finished - why not have the back look as neat as the front!